Welcome to the official CalneATB website. The crew is made up of 7 people that live in Calne and the surrounding villages. 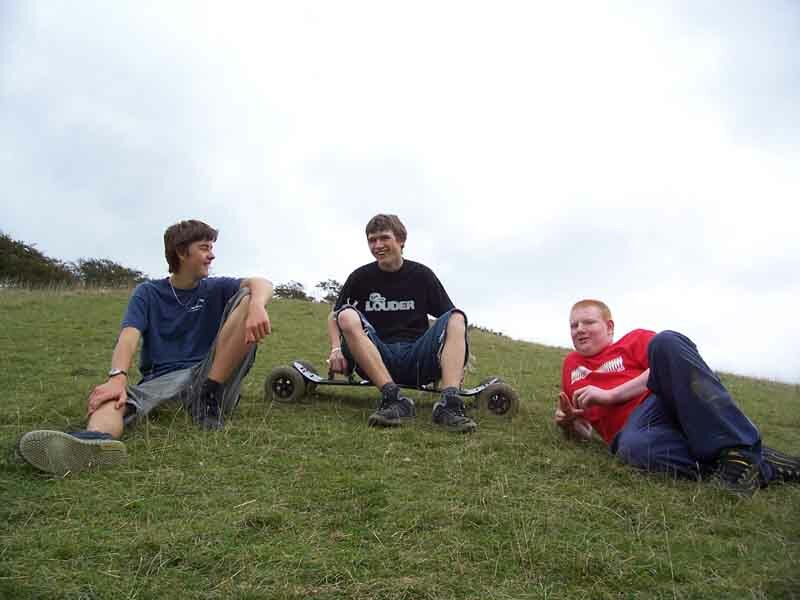 we've been riding the Calne, Wiltshire are for just under a year, and even though the standards of mountainboarding varies within the group, we are all improving and just having a good time. 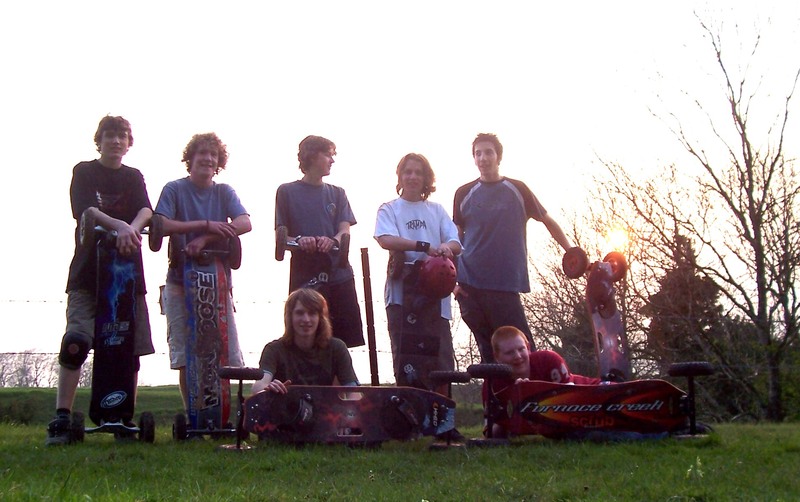 We first got into mountainboarding when Marcus had bought a board for Kiteboarding, after going out on his board without a kite, most of the group started to really get into mountainboarding, and eventually the group started getting more boards. After improving, we decided to build our own jumps, these have been great aids with helping us improve our skill. We currently take our jumps around Cherhill and Compton bassett where we do freestyle and also freeride. In the summer of 2004, after we decided to be an ATB crew, we formed this site and have been regularly updating it ever since. And so here we are today. We now hope with the new improved site, you find it easier to access the site and find out about us. Well, its been a long time since there's been an update, but its just like that. We've not been out as much as we'd have liked to have, mainly because of other commitments, such as exams. but we went out on Sunday which was nice. Role on lots of boarding in the Winter. A trip to the Marlborough Downs ATB centre this weekend, which included: Liam, Pete, Sam, Vicky, Andy and Nick, there are a few pictures of this. New pictures and videos added. Another trip to Heddington today, we now have a decent, large roller, a ridable table-top and the beginnings of a berm and large run. Pictures of today's events can be found in Pete's, Marc's, Adam's and Sam's pictures. All the CalneATB riders take another trip to Heddington which seems like its going to be our regular spot, we built the skeleton of a table-top which is rideable but still needs work doing to it. We hope to achieve the final table by the end of the month and plan for it to be around 4ft high and 8ft long. More pictures of the Thursday night adventure can be found in the 'pictures' section. Also there are a few videos of the day, including a painful bail by Marcus. A great weekend for all that came out. We have decided to create a run in Heddington, so far we have a small practise jump, however have big plans for the site. Pictures can be seen in most peoples picture sections and the miscellaneous pictures. A particular mention to Adam and Josh for improving greatly. We also hope to see a sketch of our plans for the Heddington site on the site soon. Don't forget to also check out and register on the new CalneATB forum. New pictures of a recent outing wit the new jump to the Cherhill downs. Also a tribute to Steve Young. New pictures of Marc's recent trip to the big sheep and videos of the others on the new jump. Latest news. Pete now has a new board, a Trampa Custom, also Liam has a MBS Comp 16 Pro, both bought from www.atbshop.co.uk. Also check out the new pictures from a recent trip near Heddington. Summer 2004 videos are now on the site. Information on new boards for 2005 can be found in the news page. Add CalneATB to your favourites! designed, made and maintained by Pete Slater and Marcus Woodbridge. Any questions or queries just mail us.